"A need founded the Boys and Girls of Prisoner’s Foundation San Jacinto, and we chose to do something about this problem because of a child’s cry to God in a Sunday School classroom for his daddy that was taken away to prison in 2002." "Sunday school teacher Sophia Pirelli shared with her family how this little boy’s tears and pain touched her heart. That day the family said the Lord but a desire and passion in their hearts to serve and minister to the vulnerable children of incarcerated parents. At that point the family chose to dedicate the ranch to the high-risk forgotten hurting and needy young victims." Our hope is to redirect children’s lives so they will start new traditions and will break the cycle of crime that was set before them,” said Pirelli. “To give them hope for a fulfilled, productive life so they can make a difference in their families, schools and communities. These children are shown ‘remodeling through modeling. Today, BFPF Calicinto Ranch welcomes children from any and all cities in the 10 Southern California counties. The majority of the children visiting the ranch come from Riverside, San Bernardino, San Diego and Orange counties. The ranch offers a western setting with horses, hayrides, campfires, archery, swimming, and farm animals that takes the children out of their city environment and allows them the relax, have fun and experience encouragement. 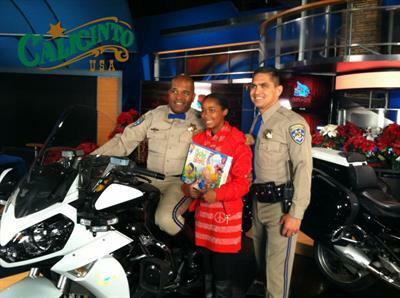 Calicinto has partnered with the California Highway Patrol and Angel Tree to provide Christmas gifts for these hurting kids during the holidays. Prison Fellowship goes into the prisons where incarcerated parents can enroll their child in the program, gets a list of items their child may enjoy for Christmas and write a meaningful note to their child. We are given thousand of names and phone numbers of innocent victims of crime. We call the caregivers and confirm their gift suggestions, age and detailed information on their children. Local churches, businesses and individuals make this an annual tradition to purchase/provide gifts for these children on behalf of the incarcerated parent. We provide a big Christmas event at Calicinto where these children come with their families for a special time of home cooked food, love, encouragement and receive 2 Christmas gifts along with the note from their incarcerated parent. It is a time of restoring, forgiving and healing for these families. Joy to the world!